Plantera is a simple farming game that combines incremental games with farming simulation, it’s simple design is reflected in the low price and will keep you entertained for a few hours as you make an efficient farming operation and idle your way to riches. Plantera starts innocently enough with players having a small plot area to begin their farming efforts. To generate gold coins from this land players can place various plants or animals that will slowly generate coins over time which can be sped up by clicking on the fruits of your labour rather than waiting for your blue workers to pick them up from the ground. Plants are split into three categories; ground, shrub and trees which can be stacked on top of each other and in turn earn more money from your limited starting space. Ground plants include things like carrots, radish and pumpkins while shrubs offer things like blueberry or strawberries. Meanwhile the towering trees offer things like pears and apples. Regardless of the plants you select they will generate produce over time which is directly converted into gold coins once you collect it (via click) or let one of your workers do it for you. 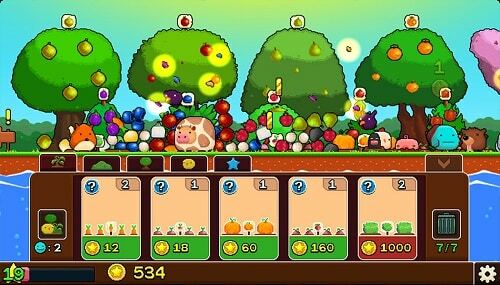 Taking these funds players can reinvest in farm expansions, animals (chickens, pigs, etc. ), gold multipliers or helpful guard dogs. These guard dogs helps automate the other primary element of Plantera which is the protection of your plants and animals from various pests. This includes birds seeking to grab a tasty piece of produce and foxes wanting to take away one of your chickens. All of Plantera’s game elements are well presented albeit simple, it’s end-game content is significantly absent when compared to other incremental games but for the price it’s hard to complain about this delightful game. Simple farming game combined with incremental and idle. 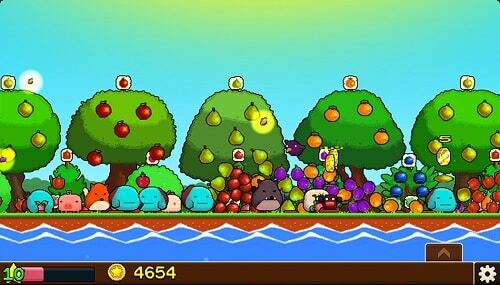 Plant a variety of tasty produce and animals. Fend off attackers that seek to steal your goods. Hire workers and guard dogs to protect yourself while offline.